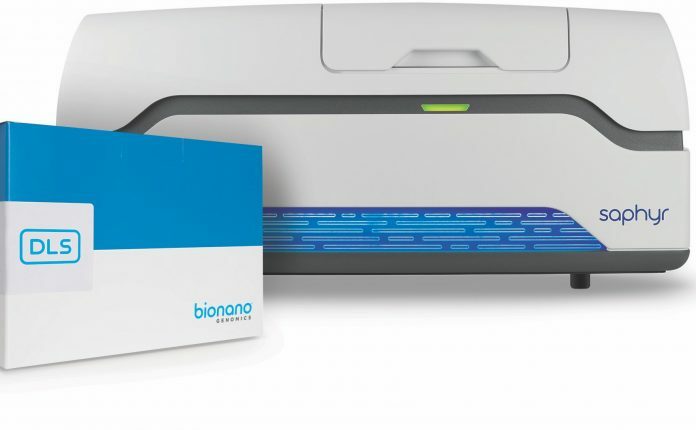 Direct Label and Stain (DLS) is a non-destructive labeling chemistry that improves every aspect of Bionano genome mapping. When used in the Bionano workflow, DLS enables unprecedented sensitivity and resolution for structural variant discoveries and the most accurate and contiguous genome assemblies. Because DLS has no destructive steps in the workflow, the systematic molecule breaks of its prior NLRS method are eliminated and involves fewer steps, fewer enzymes and effectively doubles the output of the Saphyr system. Genome maps generated using DLS are 50-fold longer, on average. DLS also improves sensitivity for all structural variant calls, yielding detection of heterozygous insertions and deletions as small as 500 bp. Applications of Saphyr include SV discovery for translational and clinical research including cancer, undiagnosed genetic disorders, gene discovery, and therapy development. The DLS chemistry makes mapping with Saphyr more affordable, allowing high-volume users to map a human genome for as little as $500.